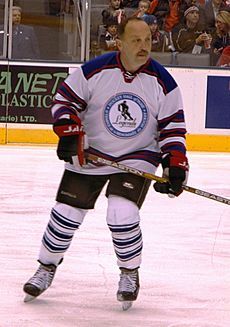 Bryan John Trottier (born July 17, 1956) is a Canadian retired professional ice hockey centre who played 18 seasons in the National Hockey League (NHL) for the New York Islanders and Pittsburgh Penguins. He won four Stanley Cups with the Islanders, two with the Penguins and one as an assistant coach with the Colorado Avalanche. On August 4, 2014, Trottier was hired to be an assistant coach of the Buffalo Sabres. Bryan Trottier Facts for Kids. Kiddle Encyclopedia.